On the podcast this week is Jillian Richardson, the founder of The Joy List. The Joy List is a weekly newsletter of events in NYC where you can go by yourself and leave with a friend. Her mission is to reduce loneliness in the U.S., and she’s starting with New York City. Through The Joy List she compiles events that encourage connection, vulnerability, and playfulness. On this week’s episode Jillian shares with us her passion for building community, the inspiration behind The Joy List, and why it’s so important to create deeper connections and choose vulnerability. We chat about creating balance when everything is a “hell yes!”, developing self-worth outside of work, and reconnecting to our femininity. Plus, Jillian and I discuss the world of freelance (she’s a pretty badass ghostwriter), her newest writing venture (she’s writing a book!) and SO much more! Jillian does so much, and when she’s not spreading joy around New York City she’s writing. Whether it’s for herself or ghostwriting for others, she specializes in authentic, conversational content. Her passion is helping people communicate their message in a way that’s unforgettable and fun. She’s written everything from think pieces for Fortune 500 CEOs to jokes for startup owners. 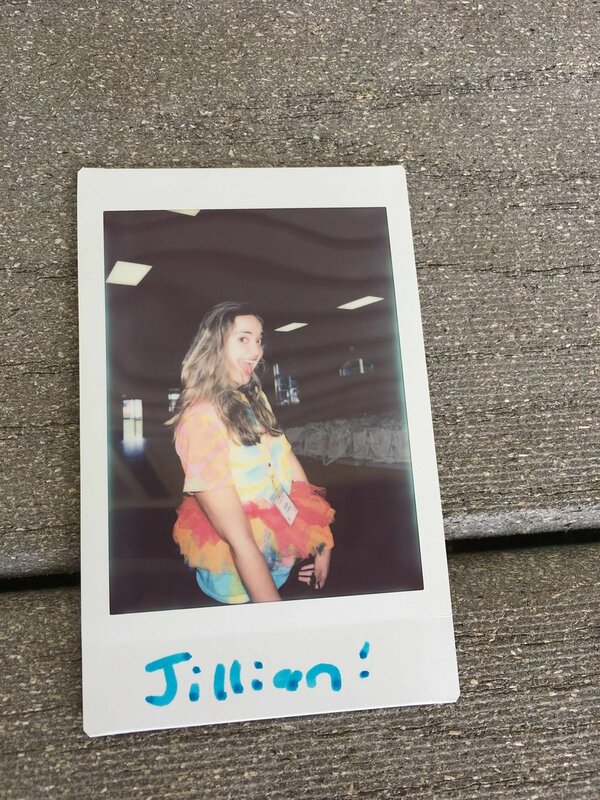 Jillian is truly passionate about creating spaces for people to have meaningful interactions and she’s doing this through creating new ways to gather in community. In addition to The Joy List, Jillian is also the creator of Hustle Fest - a conference for people who want to go from full-time to freelance; Groundshift - an event that connects and trains people who are committed to creating social justice in America; and Balanced - a monthly meditation and conversation series at her home in Brooklyn. So what inspired The Joy List? When Jillian moved to New York City she was great at meeting new people, but not so great at prioritizing deeper connection. She felt like she was constantly in spaces where “surface level” conversations were the norm. Like so many of us, Jillian was lonely. It wasn’t until she discovered Camp Grounded - a summer camp for adults - and felt a level of openness and acceptance that she’d never experienced before. When she left, she knew that she wanted to join communities that prioritized meaningful relationships. For Jillian, that meant surrounding herself with people who aligned with her values of joy, community and authenticity. It’s become a really wonderful resource for people to find events that they can go to by themselves and leave with a new friend. It’s a way to highlight the amazing work that people in NYC are doing to spread positivity and connectedness. Even more than that - it’s become a weekly gratitude practice to remember that NYC is filled with love - even though it doesn’t feel like that sometimes. For Jillian connection, vulnerability, and playfulness create joy and it was really wonderful to hear her share about how these values have influenced not only relationships in her life, but also The Joy List. There is so much power in events to create spaces to facilitate a transformation with someone. The truth is it can be really scary to start a conversation with a stranger, and that’s why events that include intentional moments of connection are so important. Vulnerability is key for connection (and if you’ve been following along for a while you know how important Brene Brown is in my life) and when a group gets together and has an opportunity to be real, honest, and vulnerable - they get a whole lot closer. That’s why The Joy List promotes events that push people out of their comfort zone and into an experience where they can make a new friend. Having fun and embracing play is huge - especially when life is so stressful and demanding. The Joy List celebrates any opportunity to let loose and get weird! Jillian and I also had a really great conversation about her work as a freelance writer and how she never anticipated for this to be her career. Growing up Jillian was surrounded by an environment that was obsessed with work, and it’s so easy for her to get stuck in the cycle of working because that’s the environment that she grew up in. When Jillian graduated from college she was a part-time freelance writer, and Skill Share (an online teaching platform) reached out to her and asked if she would be willing to teach a course on writing for their students. She ended up being one of their first writing teachers, and this experience helped her feel comfortable with the idea of teaching and being someone who’s voice is worth listening to. From there she continued writing and she’s developed quite an impressive career as a ghostwriter. From humor writing, corporate writing, to event coverage - Jillian does it all. For so many of us our self-worth is deeply tied to our work and our work ethic (I can completely relate to this). Learning, and processing, the fact that our worth is not connected to our work is a process and it was great to hear Jillian open up about this. It takes time to shift that perspective and remember that we are worthy just by being who we are, and I loved asking Jillian how she’s been able to shift this for herself. Her answer? Mindfulness, conversations with friends who just get it, and reconnecting to her femininity. Jillian practices love and kindness meditation - a practice of sending love and kindness to herself and then to others. This practice has been really helpful in reducing the inner critic in her head that says she should be “getting more stuff done.” Can anyone else relate to this inner critic in their head? Because I know I definitely can. Connecting to her femininity has also been a game changer for Jillian. Thinking about sisterhood, tapping into her feminine characteristics like kindness, compassion, and openness and choosing to strengthen those things. It was really interesting to hear Jillian reflect on what it’s been like learning how to take care of herself. I don’t know about you, but when I was growing up “self-care” and “self-love” wasn’t something that we talked a lot about. For Jillian, developing a morning routine has been huge. Taking the time to journal, write affirmations, read, and do some yoga has been huge because it’s served as a reminder to her that she’s worth loving and taking care of. But that inner critic still loves to come out and tell her that she should be doing something else, that there’s something more productive that she can do with her time. (Been there!) The truth is productivity isn’t just “work output” - it’s self-care, it’s downtime, it’s anything that fills your tank back up and gives you the energy and the love you need to keep going. Jillian’s advice? Be patient with yourself and give yourself the time and the room to get comfortable taking care of yourself in this way. Jillian is writing a book (ahh!!) and on this week’s new episode she shares with us what that process has been like. She walks us through the inspiration behind the book, where she met her mentor, and how she’s exploring the connection between religion and community and its impact on our sense of loneliness today. It was so great to hear about Jillian’s writing process, what she’s enjoyed about writing her book so far, and what’s next! As you listen to this week’s new episode I encourage you to ask yourself, what role has community played in your life? How do you authentically show up in your life? How does passion show up in your life? I really enjoyed connecting with Jillian (a fellow joy seeker!) and learning about her passion for community building through joy and vulnerability, and I can’t wait to hear what you think about this week’s new episode! To learn more about The Joy List and to sign up for the newsletter visit their website joylist.nyc and on Instagram @thejoylistnyc and The Joy List NYC on Facebook. It’s time for our FIFTH and final giveaway in our month of giveaways to celebrate the one-year anniversary of Seek The Joy Podcast! I’m so excited and I also just can’t believe that this is coming to an end.Thank you SO much to all of the generous women and companies that participated in this week’s giveaway! To enter to win (1) Six Degrees Society - a 3-pack of Networking tickets, (2) Sprout Law - The Better Business Plan, (3) Write For the Job LinkedIn Makeover and (4) Lauren Smith - Mind Love: Bite-Sized Thought Nuggets To Fuel Your Life. . .
(1) Follow @seekthejoypodcast on Instagram (2) Like the post announcing the giveaway (hint: look for this photo right here!) and (3) tag a friend who would also love this giveaway. Bonus entries for (1) following @six_degrees_society @sproutlaw @smsax @laurensmithbiz and (2) liking their three most recent photos on Instagram. Enter as many times as you like, one friend per comment! This is not sponsored by Instagram. Giveaway closes 11:59pm PST on 11/2! One winner will be chosen at random and announced on 11/4. Emily of Six Degrees Society (3-pack of Networking Tickets) is honestly amazing and she came on the podcast earlier this year (Episode 35!!) and she’s truly taking the guesswork out of networking. I discovered Six Degrees Society earlier this year when I was looking to meet more people in LA, and guys - I’m hooked! Nicole of Sprout Law (The Better Business Plan) has been such an awesome friend to me and the podcast and I’m so grateful for her. She helped me trademark this bad boy (oh and it was recently approved!!) and she’s created a series of business resources for women to launch, grow, and protect their businesses. Sarah of Write For The Job (LinkedIn Makeover) is the go-to person for putting all of your professional materials together, apply to jobs, or transition your career and I was so excited to have her on the podcast earlier this year - Episode 42!! and even more grateful to now be able to call her a friend. Lauren of Lauren Smith (Mind Love) is a business strategist, host of Master Your Mind, Business & Life Podcast, and it’s her mission to help entrepreneurs unleash their greatest potential and grow their business online. We recently connected and I’m such a fan of what she’s doing, and I can’t wait to share her new book with you! The next episode in our series, The Power of Storytelling, airs on October 16th! We want you to be part of it! To learn more and to submit your story, visit the Share Your Story section of our website. Fill out our interest form - and we'll get back to you ASAP.